Lois now manifesting her psionic Brainiac power (*transferred in Superman Annual #2) glows with a bright blue flame. Instinctively she is able to master her new powers and protects Superman. Despite her surprise attack Psycho Pirate is able to best her. Knocking Lois off her feet he offers her a place at his side as his ward if she so decides as he prepares to use his power on everyone in Metropolis. With Pirate gone, Lois makes her way to Superman and uses her light to wake him from his comatose state. An unsteady Superman readies himself to battle Psycho Pirate but a frightened Lois reveals the villains plan to drive the city insane. Hector Hammond, crawls from the rubble and offers a truce, to aid them, after all what can he rule if the city has gone mad. He is drawn to Lois' new psionic being and her raw energy may well be enough to rival Psycho Pirate. It is then that he notices the emotion slime of H.I.V.E Queen reforming. The queen is now a hideous beast, her true form not masked as a blond beauty with a psychic trick. The group is reluctant to work together but Superman points out if they don't join forces they wont have a city to fit over. They arrive too late and Metropolis is a feral mess of savage mentality. Superman pushes Pirate into the air and then with tremendous force he punches him into the ground. Pirate laughs that Superman still uses his fists in a psionic fight. Pirate orders the civilians to attack one another - but nothing happens. Lois uses her psionics to create a neural network to block his control of them. Despite Superman's lack of psionic powers he is a massive source of it so Pirate decides to drain Superman and induce a coma like before but this time when he attacks a psionic shield blocks his attack. Just as he had launched a surprise attack on Hammond and H.I.V.E, they do the same and the backlash is fed into Lois where she explains to Superman that the mask has control of Pirate. If they remove it he would be free and so would the people of Metropolis in theory. A cocky Psycho Pirate fights off the monstrous Queen and laughs that he isn't even using his full power as a sliver of his mind is attacking Superboy simultaneously. Hammond feigns fear till a smirking Pirate approaches to gloat. With Pirate concentrating on Brainiac's minions he foolishly drops his guard long enough for Superman to attack and rip the mask off. Unable to resist Superman looks into the mask and sees Ma and Pa Kent looking back and under trickery he places the mask on. Lois reaches out begging him not to give into the Medusa Mask's control until she finally reveals she knows he is Clark Kent. The jolt of that revelation gives Superman enough control to tear the mask off and incinerate it with heat vision. Lois falls to the floor and Superman races to her side and cradles her. As Lois used up all her energy to save the people and Superman her fiery powers begin to leave her. Lois begins to fallback into her coma but before she does she reveals until now she hadn't really connected the dots about Clark. Superman reassures her as she fades away that no matter what she will always be his best friend. Clark meets Jonathan at the hospital and explains away her absence, they decide she must have had enough strength to make it into the streets but during the madness she fell ill again and that is where Clark found her. Jonathan is optimistic that if she partially woke from the coma she must be fighting back. 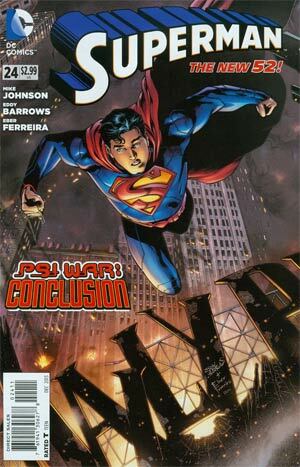 Superman races away and vows to search for a cure to Lois' psionic coma. While returning her to the hospital he realizes he allowed H.I.V.E Queen, Hector Hammond and Psycho Pirate all to escape. Brainiac, indirectly the cause of this Psi War might also still be out there somewhere. He has no time to process any of it as he suddenly finds himself tugged by an invisible force into deep space, there he is struck by a bolt of golden energy. Story - 4: Psi War is over. The action is solid even though the story is not (I mean the overall 'saga'). I still question what Psycho Pirate hoped to achieve as a final goal. I do hope though that we don't see any of the 'twenty' for a few years now as the story just seemed to go on forever and the pay off was not a good one as... nothing really happened. As the aftermath though Hammond is now awake, H.I.V.E as an organization is gone and the biggie - Lois knows. I thought the 'Juggernaut versus X-Men' finale was pretty lame but I really liked Lois' monologue. The insights into her past, her sensations and feelings being temporarily superpowered were great. All of the character moments were extremely well done. 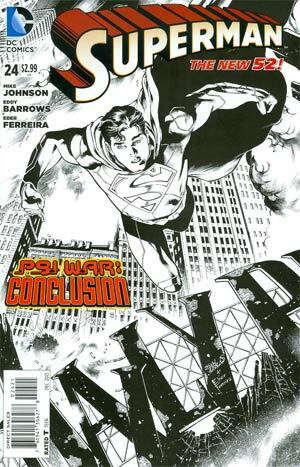 Reading Mike Johnson's past work it's very clear he's the clean up crew on this so I hope we get to see his Superman stories shine. Art - 4: Solid art that looks great. When Barrows was illustrating "Grounded" it was a crying shame that his art wasn't given more to do but here you can really see it brought to life. Great composition. Cover Art - 3: The art rating and comments I just made make this rating a regretful one. With the build up of over a year, the big finale cover is looking fearfully down over something we can't see. Surely something more 'lively' or attention grabbing would have been better?